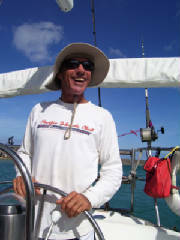 As a 100 ton master with sailing and towing endorsements, Captain Ken Pier is fully licensed, including CPR and first aid training. His father, a former captain in the Navy and an expert navigator, began imparting his sailing and navigational knowledge to Ken when he was only 8 years old. At the age of 16, Ken sailed with his father on a 31′ Cheoy Lee called the Pixie, through Hong Kong, Manila, Palau, Guam, and neighboring islands. Two years later, his father passed away. Ken and his wife Libby sold the Pixie and went to California, where they bought their first sailboat, a beautiful 45′ Ketch called the Illahee. Over the next 2 1/2 years, they sailed up and down the coasts of California and Mexico, and eventually to and through the Hawaiian islands. They sold the Illahee, and spent some time traveling. In 1976, Ken started his business, Arrow, making surfboards in Australia. Three years later they moved back to Guam, where Ken started the company Da Kine, selling surfing gear. They moved to Hawaii, where Ken continued to make Arrow surfboards and later sold Da Kine. In 1981, they settled back on Guam. Ken began fishing on a regular basis in 1984 and was fishing full time by 1987. 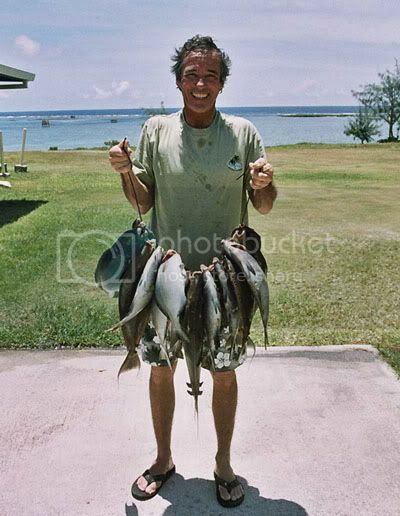 He was won or placed in many local fishing derbys and has gained extensive wisdom and knowledge of Guam’s coastlines, under water topography, fishing spots and weather conditions. He has been fishing full time for over 20 years now.